The Next Stage: Women and Retirement: Reproductive rights are human rights! Reproductive rights are human rights! Every year I look forward to the Roe v. Wade visibility event. It is gratifying for this aging abortion rights supporter to see so many young women picking up the torch! Unfortunately, I didn’t make it this year as my husband was sick and I didn’t want to leave him—although he insisted that I should go. I’ve heard from friends that the event was a huge success. I am a gratified to see the movement for reproductive justice becoming more diverse in race, ethnicity and gender. 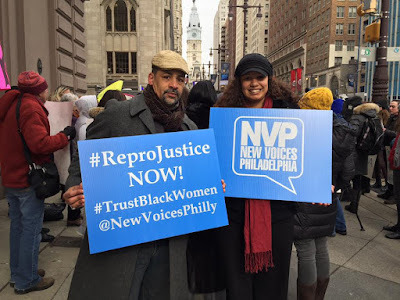 There are increasing numbers of young men, such as candidate for the PA house Chris Rabb( pictured above) who see the struggle for reproductive justice as their fight too. The bad news of course is that we are still fighting this battle. In the 1970’s I never, never thought we would still be fighting to defend abortion rights in 2016. We have to win this battle once and for all.